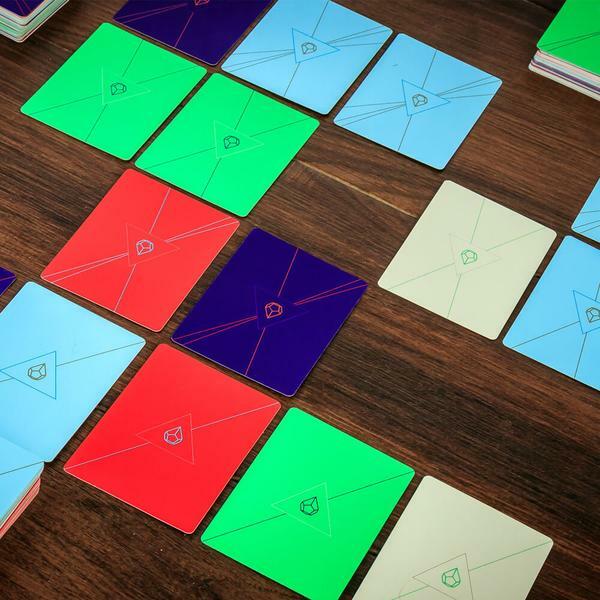 Aura is a card game where every player starts with an identical deck of cards, containing the same number of cards in 5 different colours. Each colour has 10 cards, 1-8, a wild and an action card specific to the colour. On a player’s turn they play 2-5 cards face down in front of them. The cards placed must either all be the same colour, or all different. Each other player can see the colour of the cards played, but cannot see the value. Then the other players choose to play as many cards as they wish parallel to the cards of the active player in subsequent rows with the goal of “blocking” as many of the active player’s cards as possible. The other players do not have to play as many cards as the active player, however, they cannot play more. Once all cards have been placed, the cards are revealed, wild cards are declared, and action cards (starting with the active player) resolved. Once the wilds and action cards have been resolved, each player will compare their cards with the active player’s cards. They do not compare their cards with the other players, only the active player. When comparing cards, the players first look at the color of the cards. If they are the same color, then the active player’s card is blocked if their number is lower than the other player. If they are not the same suit, then only the trump suit can block the active player’s card. The only caveat to the above rules is if the active player has “chained” cards together. 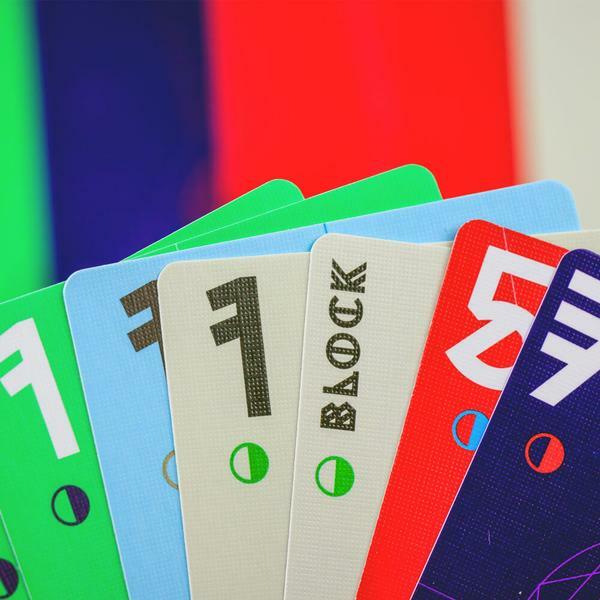 The active player can “chain” cards together by playing cards of the same number. If they do so, then each player must successfully block all “chained” cards, otherwise none of the cards are counted as blocked. For every card that the other player could not successfully block, they will have to discard a card. Every played card gets placed below the Aura card which starts at the bottom of your deck and the player’s draw cards for the next turn. Once the Aura card reaches the top of any player’s deck the game ends immediately. The player with the most cards in their deck and their hand combined, wins. Aura is not a bad game and for some, it might even be a good game. For me, the game doesn’t bring enough to the table for me to suggest we play it very often. However, there are a few things that I do enjoy in the game and if those are attributes of games that you really like, Aura might be a game for you. In fact, for younger players, this could be a good game to get them thinking strategically. For the first couple games it is recommended to not use the action cards, however I think that is only necessary for younger players. I, personally, would only ever want to play with the action cards as they add for some uncertainty of what cards to play. Since you never know if it is a wild, or action card you have to account for any of the possibilities. I have a love/hate relationship with the “chaining” ability as it allows you to win with lower numbered cards, but because of the randomness in the cards it can seriously determine the winner if they are lucky enough to be able to “chain” on a regular basis. I wouldn’t say there are a lot of bad things in the game, except if a player is able to count cards, then their chances of winning increase drastically. Maybe I don’t like that because I definitely do not have that skill, but either way, it is something to consider when deciding with whom to play. The game is not very difficult at all. Sure, there are some strategies and tactics to learn, but after a quick game without the action cards, most players will be able to pick up the rules without a problem.